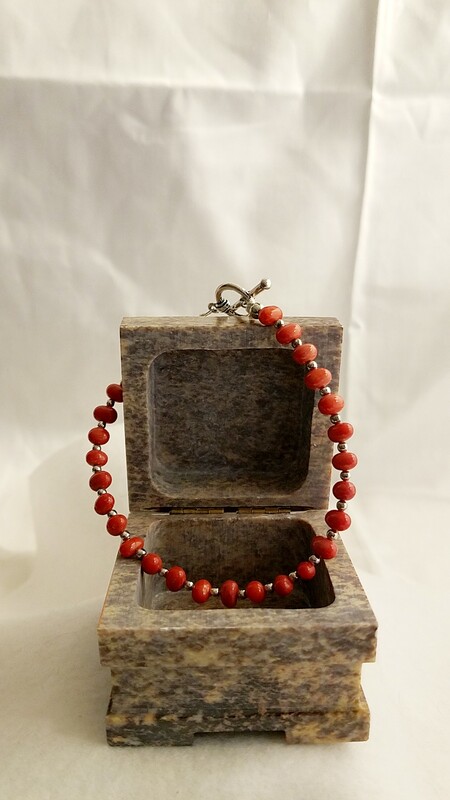 This Delightful Red Bamboo Coral Bracelet is charming. 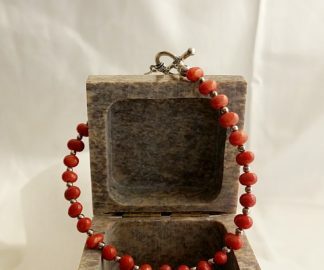 This Red Bamboo Coral Bracelet with Silver Accents is one of a kind item and can’t be back ordered or custom ordered in a different color. My Mother only made one of these and you will have a piece like no other person has, it is a Storm Shadow’s Jewelry Original. This Delightful Red Bamboo Coral Bracelet is charming in its Rich red tones. This bracelet is made from Bamboo Coral which is a deep sea coral. It has a rich red color that will look great with any outfit. From that LBD to your favorite pair of blue jeans this bracelet will give you just the oomph you need to make it look divine. Bamboo coral – is a deep sea coral. This particular coral made up of calcium carbonate and forms in treelike branches alternating with joint-like nodes axes composed of gorgonin protein. The bony structures give the bamboo coral a finger-like appearance similar to that of the bamboo plant on land. This bracelet unique as it can’t be back or custom ordered in a different color. The reason is My Mother made it. There was only one of these made. So, since she no longer with us, there will be no more made. You will have a piece like any other person has. 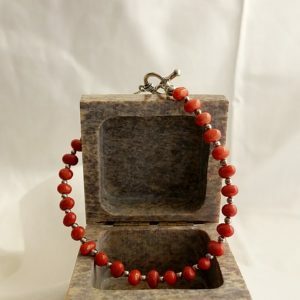 If you would like more information about the gemstones and items I use in making my handmade items like this, Red Bamboo Coral Bracelet Materials Description Page. and my Chain Maille Descriptions page. Let this Red Bamboo Coral Bracelet make your outfit look divine.